Hi 🙂 Yes, I just used a smiley face. Sorry, I just get all gooey inside when I say your name.. Anyway, I’m actually writing to criticize you. Or your stylist. But.. I’m sorry.. I actually think this might be your fault because I can’t imagine there’s a stylist in the world that would allow you to wear the SHOES you do. You look hot, as always. And look at cute little Kristen in her adorable little heels. And Catherine is rockin’ the hell out of those boots. But is there a war in Paris that I’m unaware of that you’re planning on fighting in after your photoshoot? 4) They make you look like my 15 year old sister’s boyf. They are totally shoes for people born after 1990. I have other examples, but this is already a hard enough post, critcizing you, so I’ll stop. Yeah, yeah, I know. Not practical shoes for an every-day photo opp, but yummy pic, so I had to throw it in! I’m not gonna lie. I’m a fan of the chucks. Always have been, always will be. In fact, a pair in light grey, just like the ones you wear here, are on my xmas list. What a coincidence. Maybe we could wear them together? And hold hands while doing so… just like twins… or lovers.. or whatever.. You could put your head on MY belly..? 3rd pic… i think i’m more disturbed by the low-budget vamps they rented for the london premier. seriously guys? I so commented on this on a forum, and umm no one seemed to be bothered by the creepy *BEAUTIFUL* VAMP ENTOURAGE! Who are they supposed to be?? Edward’s PEEPS? Vampire Movie Stars? I was so confused by them. In some of the pictures you can tell Rob was too! Holy cow! His shoes had been bothering me as well! I am so glad UC and Moon that I am not the only one…and his black Nike sneakers…he wears them EVERYWHERE! He wore them last year and even this year at the Teen Choice Awards! He really needs a new stylist…. 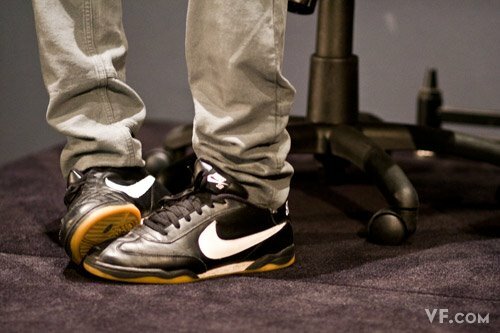 Ugh, those black Nikes are indoor soccer shoes(I work at one of their stores). Not meant for walking around it, and they are ugly to boot.